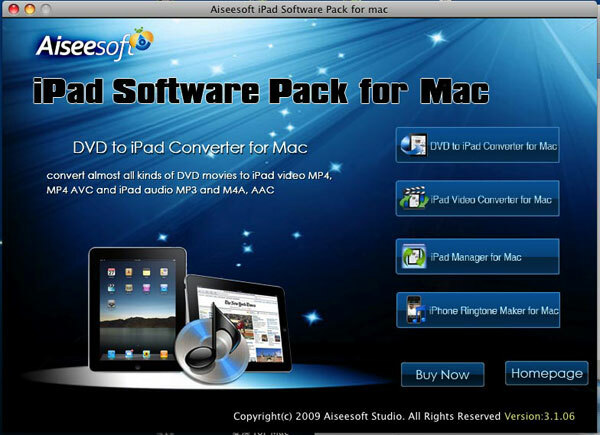 Aiseesoft iPad Software Pack for Mac, powerful iPad software tools for Mac users, which contains the following four professional iPad software: iPad Video Converter for Mac, iPad Manager for Mac, and iPhone Ringtone Maker for Mac. With this special Mac iPad Software Pack, you can fully convert any popular video/audio to iPad MPEG-4, H.264/MPEG-4 AVC, MOV, M4V video format and AAC, MP3, WAV, AIFF, M4A audio format. Moreover, you also can both backup iPad videos/audios/pictures to Mac and import files from Mac to iPad. The iPhone Ringtone Maker for Mac can help you make your own iPhone ringtones. It is available to convert any popular video to iPad MPEG-4, H.264/MPEG-4 AVC, MOV, M4V video formats and AAC, MP3, WAV, AIFF, M4A audio formats. Transfer videos/songs/images between iPad and Mac. Then you can easily share files with your friends, and no worry about file missing. Convert any popular video and audio to iPhone M4R ringtones to make your iPhone Ringtone special. Aiseesoft iPad Software Pack for Mac can help you trim any segment of a video, cut off the unwanted playing area or black edges, merge several pieces together and add a text/image watermark to a video. The built-in player can help you preview the video effect before converting for you to get a full control. The intuitive interface can make the operation quite easy. What you need to do is just click your mouse and wait.